Any business leader who has experienced the rapid growth of their company will undoubtedly have stories to tell about the trials and tribulations they’ve experienced along the way. Their business operations and executive decisions will have had to change, as well as their management of finance, product development and competitive strategy. The company structure will have grown and evolved, and logistical challenges overcome. 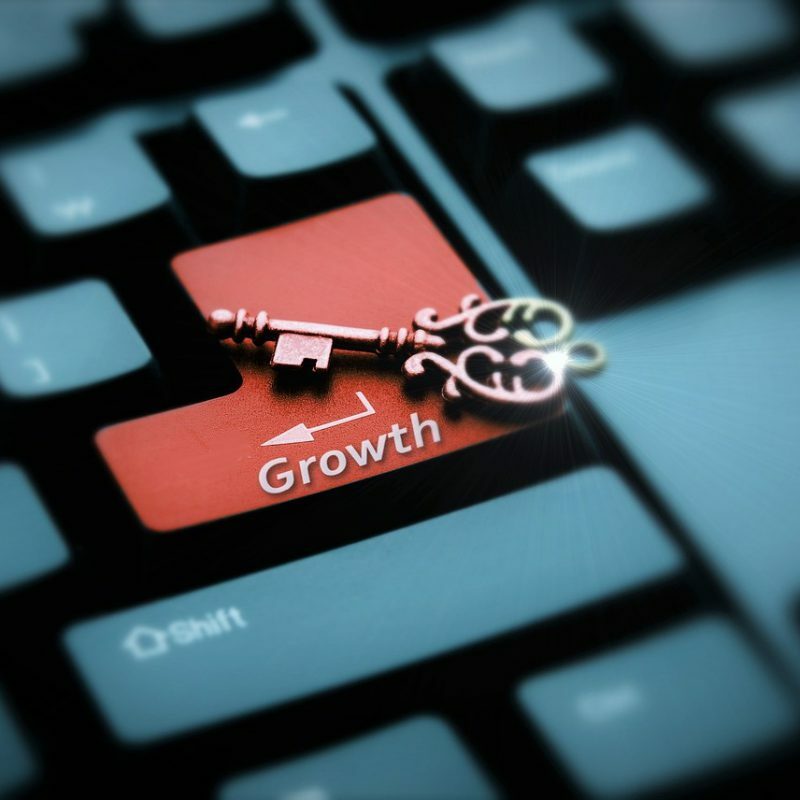 From start-up through to a large corporate entity, the business landscape is an ever-moving feast, but there is a typical pattern to the growth stages and challenges facing fast-growing businesses. The infographic below shows “The 6 Stages of Growth” based on research of more than 750 fast-growing businesses. Leading a fast-growing business can be chaotic and very challenging as old strategies, approaches, systems and people are overwhelmed by the increased volume and complexity. As business coaches, we regularly help business owners recognise and navigate through these challenges, so they can successfully transition to the next stage of maturity. Every fast-growing business is different, and the focus of our coaching support will be specifically aligned with the business and leadership challenges being faced at that time. But again, our experience shows that there is a pattern to the areas we typically focus on in our coaching sessions. 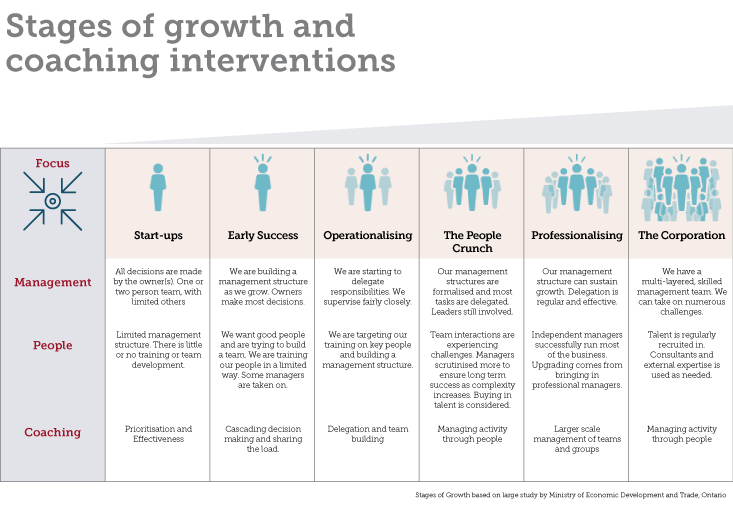 Use the infographic above to identify where your organisation sits right now, where it is heading, and how coaching really can make a big difference to the successful growth of your business. Prioritisation is key here to ensure the precious time that you have is used wisely and you remain focused on the important task of looking after your customers and growing the business. You will typically be a jack-of-all-trades at this stage, but you also need to recognise your strengths and the areas where you should involve others, so you don’t become a bottleneck for the business’ growth. Coaching can help you plan your time, analyse what’s working and what isn’t, and move your efforts from reactive to proactive. With the right time management tools and open mindset, you will learn how to drive the business forward without burning yourself out. As you progress through to early expansion, you’ll need to hire good people, train them, provide good direction and delegate well. This is about making the best possible use of these new skills and the resources you have hired. A coach can help you assess which part of your business needs more resources and to build a plan of expansion recognising the implications on profit, premises, policies, processes, funding etc. A good coach will help you look at alternative ways to get more resources – full-time staff is only one of many that may go into the mix! Inevitably, as the business grows, you’ll be building a team around you to help share the load. At this stage, it’s important to learn and understand the art of delegation, whilst staying in touch with the operational side of the business. By now you’ll hold a position of influence, from which to build a team, create a business structure and put in place systems and processes to be able to scale up your business efficiently. Business coaching will guide you through this process so you can build a strong team, delegate responsibilities with clarity, whilst keeping customers the focus of your decision-making. At stage 4, your main role will be managing your people. Most tasks will be delegated and a management structure will need to be put in place to oversee the different aspects of the business. The success of your business will rest more now on the talents and capabilities of your teams, and their leaders. A business coach will help you focus on developing leadership skills, and improving personal effectiveness for both yourself and your key staff as your business become increasingly large and complex. Your business coach will challenge you at all stages of business growth, and no more so than at this stage. It’s important to revisit your business plan and to step away from the operational side of the business to think more strategically. There will be questions to ask such as what are the barriers to growth? Are there opportunities to diversify into new markets? Your people are still key to the success of the business. The culture you build will be an important influence on the talent you hire and retain. The management structure will be on a large scale, bolstered by professional executives so that it can sustain growth. With coaching, you’ll have the guidance and opportunity for a structured set of conversations to steer you through the challenges and decisions being made. As a CEO of a large corporation, your business is only as strong as its people. It’s important to maintain investment in your talented leaders, so they in turn can nurture and develop highly effective teams. This is an opportunity to drive them forward, to stretch their potential so they become high performers in their own right. Investment in coaching, in leadership qualifications, and in developing a coaching culture within your organisation will enable the business to innovate, to be visionary, to be goal driven and to have and retain highly loyal, motivated and talented people. Business owners in high growth businesses often receive little or no training in the art of leading people – they simply grow with the business. The two options therefore are to either experience the torment of growing pains – or to align themselves with a business coach who will support, challenge, listen and pose relevant questions along the way. It certainly needn’t be lonely at the top. A business coach is someone who is on your side, provides an all important sounding board and will themselves have experienced the challenges you face every day. We believe that coaching should always have a place at the heart of leadership, so much so that we encourage our clients to embed coaching within their organisations. You may be interested to read a case study about Corona Energy, a company that we worked with to embed coaching in their business during a period of significant expansion. Read on to find out how Building a coaching culture contributed to impressive growth results and brought out the best in their 170 staff.